In the first part of our Triathlon Cycling Tips article series, we covered the 18 most important things beginner triathletes need to know about bike equipment and gear. Today we’re moving on to something that a lot of triathletes tend to skip, don’t do often enough, or don’t do well enough: Bike maintenance and service. Bike Maintenance Checklists: Quick 'n easy weekly routine and monthly routine for tiptop bike condition. If you already know some of these bike maintenance aspects and don’t need to read the entire article, use the navigation menu below to go directly to the topics you want to learn more about. Again, see the previous article in the series for tips 1 through 18. If you’re a beginner triathlete with no previous cycling experience it’s normal to paint this up as something much more difficult than it actually is. Let’s bust that myth first. It’s really not that difficult. Practice changing flats at home several times until you’re confident you can do it on the road as well. Get out of traffic (if you’re out on a ride). Remove the wheel of the flatted tire by opening the quick-release on the skewer. Lay your bike down with the drive side (where all the “stuff” - derailleurs, chain etc. is located) facing up. Or lean it against a wall or something, but make sure it’s stable and won’t fall. Use your tire levers to remove the tire from the rim of the wheel. Depending on the stiffness of your tire, this can be a bit tricky at first, so practice at home! Newer tires are often stiffer. Inflate a little air into the inner tube and squeeze it until you hear a fizzing sound and can locate the puncture. Check the inside of the tire at that location for gravel, glass or similar that can have caused it. If you didn’t find anything in step 5, run your finger along the entire length of the inside of the tire and see if you find any potentially puncture-causing objects. Inspect the inside of the tire visually as well. Remove any suspect objects that you find. Put a little air in your spare inner tube to make it easier to put it back in place on the wheel. No need to pump it up much. Just a little to keep it firm against the wheel. Check that the tube is not pinched between the rim and tire or it’ll blow up when inflated. Then inflate to around 95 psi (my research backed recommendation for optimal tire pressure) using a pump or CO2-inflator. If using CO2, you can use the entire cartridge if it’s a 12 g one, but for 16 g cartridges you should leave some CO2 in the patron or you’ll over-inflate the tire. Put the wheel back on your bike. Note that I didn’t write anything about patching up flatted tubes. That’s because I’ve found that it’s just not worth the extra time and hassle. Patching up tubes doesn’t always result in perfectly repaired punctures, and there’s nothing more frustrating than to find your newly patched tube start leaking within minutes of getting back on the bike and having to repeat the process all over again. I’m super happy to pay a few extra bucks to have a stock of spare tubes at home so I can always bring an intaxt tube with me on my rides for a quick and fool-proof fix of my flats if need be. Your hands will get dirty so wear black shorts and wipe the dirt off on the shorts. If you’re wearing white shorts you’re sooo out of luck. A clean bike is a healthy bike. Keeping your bike clean by sticking to a regular cleaning schedule is one of the most effective ways to preserve your bike. A good habit to get into is to give your bike a quick wipe down with a damp cloth immediately after riding it to remove sweat and grime. Sweat, in particular, can become a problem down the line since it can cause corrosion of metal parts. You should do a proper wash up of your bi-weekly to monthly, depending on how much you ride, on what kind of roads you ride, and in what weather conditions. Wet your bike with clean water. Don’t use a high-power car wash hose or similar. Use either a hose with a gentle flow, or use a wet cloth or sponge and wipe your bike. Degrease the drivetrain (see section 21). This can get a bit messy so you want to do this before going on to clean the rest of the bike. Use soap water, a sponge, and a soft brush to wipe the bike clean. Use the sponge for the frame and easy-to-get-to areas and the brush for areas inaccessible for the sponge. Use a dry cloth to wipe away excess water. Lubricate the drivetrain (see section 22). Degreasing the chain, chainring, cassette and derailleur pulleys on a regular basis is an absolute necessity for extending the life of the drivetrain and increasing your bike’s performance. I recommend you do it as part of a monthly cleaning routine. At least. The reason you want to degrease these components is that over time road debris will start sticking to the lubricant you’ll apply to reduce drivetrain friction. When this happens, that friction actually increases and drivetrain wear is accelerated. There are a lot of good degreasers to choose from. 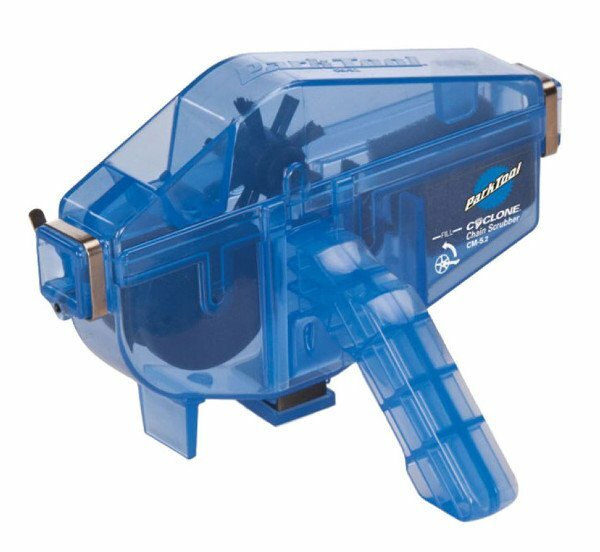 Degreasers come in both liquid form and in spray cans. I use both kinds. Spray for quick cleaning sessions and liquid for more careful cleaning. Ask your local bike shop for recommendations. With degreaser spray, just apply a generous amount to all parts of the chain, cassette and chainring. Spinning your pedals backward to get the chain moving while spraying is ideal. 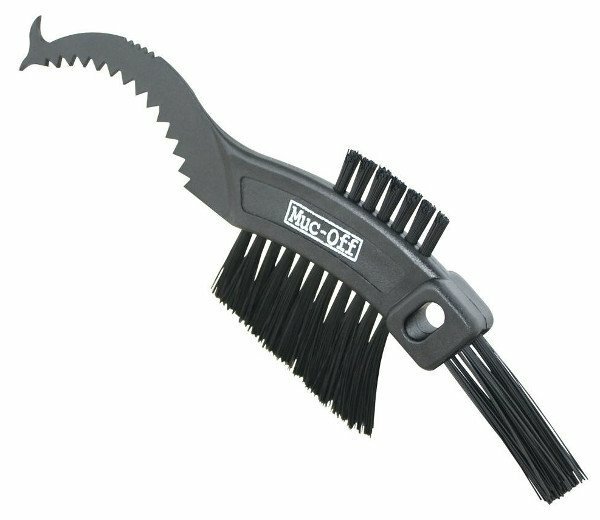 With this tool, you can easily clean the chain and derailleur pulleys with the brush end, and the crescent-shaped end is used to get to the cassette and the space between the cogs. You can also use an old dish brush for larger areas like the cassette and a toothbrush for the chain. When you’re done, let the degreaser work for minute or two, and then wipe off any excess with a piece of cloth. When you’re done degreasing the drivetrain it’s time to apply new lubricant (or simply “lube”) to the chain. Quick-and-dirty way #1: Use spray lube and apply it roughly evenly to the chain links while backpedaling to get the chain moving . Quick-and-dirty way #2: Apply liquid lube to the chain with a brush while backpedaling as above . Be careful not to apply too much lube here. Less is more! The purist way: Carefully apply a single drop of liquid lube to one chain link at a time. Use a marker pen to mark the link where you started. My recommendation is to pick one of the quick-and-dirty options for your shorter cleaning sessions and the third option for your more careful cleaning sessions. Don’t apply lube to the side plates of the chain. The rollers of the chain links is where you want the lube to go. When you’re done lubricating, wipe off excess lube with a clean rag. The chain will start attracting a massive amount of road debris immediately otherwise. Your choice of lube will vary depending on your local weather. Dry lube doesn’t pick up a lot of debris, but it washes off quickly in wet weather conditions. So use dry lube if your weather conditions aren’t particularly wet. Wet lube can handle nasty weather conditions well, but picks up more debris. This makes it the better option for wet and rainy climates. Before we get into brake maintenance and service, let’s take a look at the anatomy of bike brakes. Make sure the brakes are centered, with equal gaps on both sides of the rim. Make sure the gap is small enough that you get good braking power without letting it be so small that the brake pads are actually touching the rim. Inspect the brake pads for wear. Pay attention to the brake cables. Make sure the wheels are centered first. If not, release the skewer, reposition the wheel and lock it back into place by closing the skewer. Loosen the bolt holding the caliper in place. Then center the caliper by hand, before tightening the caliper mounting bolt again. For fine-tuning the brake alignment you can tighten or loosen the setscrew. This will move the caliper just slightly right or left, so you can find the perfect brake alignment. Now it’s time to adjust the brake pad to rim distance. Make sure that there is some clearance between the rim and brake pad. A good starting point if you’ve never adjusted your brakes before is to aim for a distance of around 3 mm. Release the cable clamp bolt to loosen the cable. Use one hand to squeeze the caliper so you get your desired distance to the rim. Hold the caliper in this position, tighten the cable and close the cable clamp bolt. Make sure you keep the cable tension while tightening the bolt. Pull the brake lever to check that it engages appropriately. That is, it doesn’t go too far back before you start braking, but it goes far enough back that the braking engagement suits your personal preference. If you need to fine tune the cable tension, then use the barrel adjuster. Loosening it increases cable tension so the brakes engage sooner and tightening it decreases cable tension so the brakes engage later. You should check your brake pads for wear regularly. Since it’s such a such a quick and easy thing to do I recommend checking them as often as weekly — at least if you do a fair amount of riding. Some pads have groove indicators to help you determine whether they need replacing, but for some, you need to trust your own judgment. If the pads look worn, they probably are, and it’s time to replace them. Release the bolt fixing the brake shoe to the caliper and remove the brake shoe. If the brake pads are integrated with the shoes, throw the entire unit away. Otherwise, loosen the bolts on the shoe to release the pad and just discard the pad. Install the new pads on the shoes in the right direction. The correct direction is indicated on the pad. Installing is a simple matter of tightening the brake shoe bolts you released in step 2. Fasten the brake shoe to the caliper using the bolt you released in step 1. It’s a good idea not to tighten the bolt all the way at first. Instead, leave some room for moving the brake shoes around and pull the brake lever and check that the brake pads are correctly positioned. The brake pads should run along the center of the rim all the way, and not hang below it or extend above it. When you’re happy with the brake pad position in the lever squeezed state, complete the tightening of the bolt so the brake shoes stay fixed. If you’re a bit intimidated by the thought of starting fiddling around with and adjusting your gears you’re in good company. 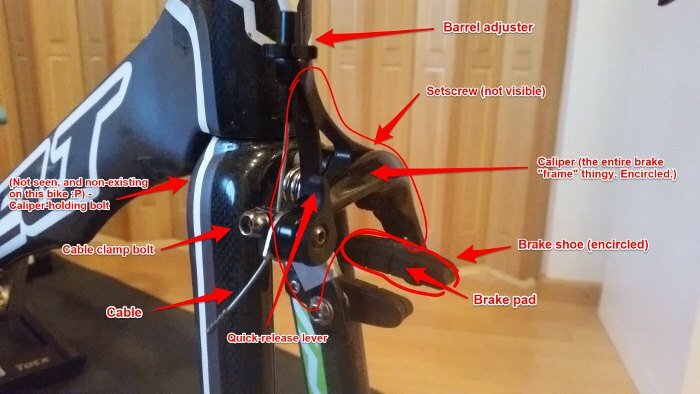 Truth be told, there is a fair bit of complexity that goes into it, so many seasoned triathletes still resort to just turning their bike into their local bike shop if they need adjustments done. And that’s perfectly fine, but there’s nothing preventing you from doing at least part of the adjustments you need yourself. The tricky part is often not the actual execution of whatever adjustment you need done. Rather, it’s knowing what to do to correct issue X, Y, and Z.
That’s why I made a flowchart for you. Identify the problem or adjustment you need to make, and the flowchart will guide you to what action that requires. 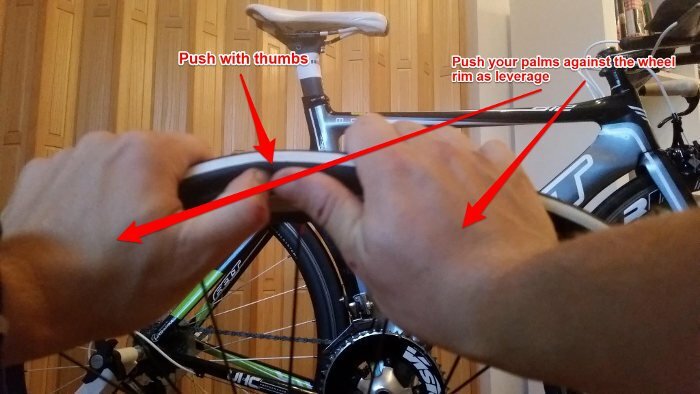 I’ve then linked to the best tutorials on the internet for each particular adjustment that you can use as you make the adjustments on your bike. 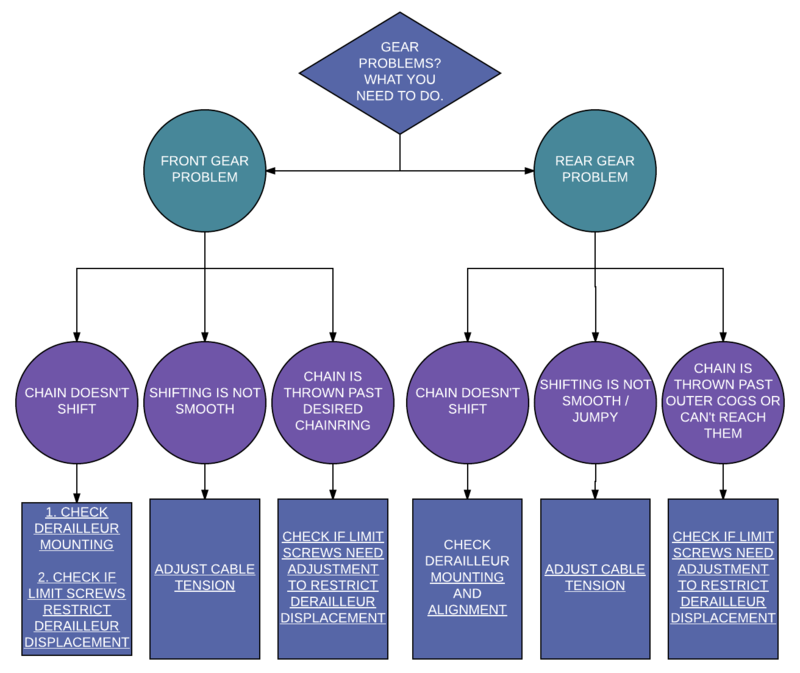 For any issues not covered in the flowchart or if the adjustments you did didn’t solve the problem I recommend handing the problem over to the pros and take your bike to a good bike shop. This is an average maintenance schedule. How often you should perform these procedures depend on how much you ride, in what weather conditions you ride, what bike you’re riding, and so on. Lubricate your chain and wipe off excess lube. Do a quick wipe down of your bike to remove grime, sweat and spilled sports drink and gel from your bike frame. The quick ‘n easy way to do this is to spray an all-purpose cleaning agent on a clean and dry rag and wipe the bike off. It doesn’t need to be perfect. Spend just a minute on this and you’ll have wiped your entire frame carefully enough. Check your brakes. Are the brake pads still going strong or are they getting worn down? Are the brakes centered? Does pulling the brake lever engage the brakes properly or do you need to adjust the brake to rim distance or the cable tension? Check your tires. Are there any sharp objects stuck in them that might pinch through and puncture the tube? As for your monthly maintenance check-up, here’s my recommended operating procedure. Degrease your drivetrain (see section 21). Lubricate your drivetrain (see section 22). Tires (see section 25). Also, check if the thread is getting so worn it’s time to change tires. Gears (see section 24) and chain. Depending on how much you ride you may need to change your chain every six months or so. This video covers how to check your chain for wear. Inspect the mechanical parts and in particular the bolts of the mechanical parts. Make sure all bolts are still tight. If a bolt has come loose, tighten it. If you have a carbon fiber frame you’ll need to tighten some bolts using a torque wrench to make sure you don’t over-tighten them as this can damage the frame. Again, this is a rough average. You may need to adjust it to suit your riding better. Discussing with a mechanic or an experienced cyclist in your local area to nail down what your ideal weekly and monthly maintenance schedules should look like is a good idea. Even the most dedicated home mechanic should take their bike to a local bike shop (LBS) at least once a year for an annual check-up. A good time to do this is right after you’ve wrapped up your training and racing season. The purpose of the check-up is to let professional mechanics do a thorough inspection and decide what parts and components need replacing, adjusting, repairing, and so on. How much service you end up needing for your bike depends on how well you’ve done your maintenance during the season, how much riding you’ve been doing, what kind of weather you’ve been riding in, etc. The annual check-up and service does come at a price (again, depending on how much service is needed). But the return on investment you get in terms of a great life extension of your bike and better bike performance makes it worth every penny. Don’t skip your annual check-up, and don’t skimp on it. While not an actual maintenance procedure, how you transport your bike definitely plays a role in maintaining the condition of your bike and extending its life-length. Your options obviously vary depending on what type of car you have. If you have a large enough car that you can fit your bike in the back of it then that’d be my go-to option. Remember that you can easily remove one or two wheels from your bike to make it take up less space. By transporting your bike inside your car you avoid the risk of getting it damaged by road debris. And your drivetrain won’t be subject to as much road dust so you won’t have to clean it quite as often as if you transport your bike outside your car. Make sure that any other stuff lying around in your car won’t start rolling around all over the place and potentially damage your bike. Using an old towel or some other form of protection between your bike and contacting objects is a good insurance against scratches and damaged paint. This is especially important if you’re transporting multiple bikes in your car. A roof-rack is a good second-choice option if you can’t transport your bike inside. Your bike is kept high above the ground so the amount of road dust and debris it can become subject to is significantly less than on the back of your car. A mix of these first two options is to transport your wheels inside the car and the bike on the roof-racks. This is particularly relevant if you have a set of expensive wheels. Invest in a good bike rack. It should keep your bike still and not cause any unnecessary stresses on the bike frame. This is extra important for carbon frame bikes. Any old aluminum transportation rack is a big no-no as it can damage the frame. Well-padded contact surfaces and a fastening system that doesn’t cause shear stress or strain to the frame is a must. You can use old inner tubes to further stabilize the bike to the rack. This is a good use of those old punctured tubes you have lying around. For air traveling, you should get a bike transportation bag or a rigid bike case if you value getting your bike to the destination in one piece. These bags and cases are pretty expensive, but the good news is that you can often rent them from your LBS or from a triathlon or cycling club if traveling with your bike is more of a one-off occurrence. Right folks, that's that about bike maintenance. ​Riding, bike handling skills and technique. Remember that the only way you'll get any benefit from learning all of this stuff is by taking action and implementing your own bike maintenance routine​. Get started by downloading these two essential bike maintenance checklists right away. These are extremely easy-to-follow checklists for doing just the bike maintenance you need, no more.